Good game management is huge in Rugby Union. Ask people what game management is and you’ll likely be pointed in the direction of a kicking fly-half or halfbacks. Of course, kicking from 10 is part of it, but collectively it’s about the direction the team moves in at any given time, the approach they take to that period of play and how accurately they execute it. It can halt a team in its tracks, stealing their momentum. It’s a way for a team to control the scoreboard and for Wasps, in their loss against Harlequins in the European Rugby Champions Cup, it should have been a way for them to snuff the life out of Harlequins resurgence. The game unfolded in a bizarre almost dreamlike manner. With Wasps struggling to maintain momentum after tearing into a 21 point lead before Harlequins had even warmed up. Even when things settled down they managed to build a second-half lead of 16 points, plus a bonus point, when Macken smashes through Roberts tackle to score on the 55 minutes mark. After Harlequins make a hash of the restart you’d have been forgiven if you’d just gave up, changed the channel and watched Northampton put it to Clermont. The botched kick off is an opportunity, I think, to execute an 8-9 move or a kick into the corner. Either would have seen Wasps putting Quins under pressure in their 22. However, Wasps concede a penalty for hinging at the scrum and the entire game was spun on its head. In truth, McIntyre, Johnson and Cooper-Wooley have been struggling at scrum time and it's probably fair to say Wasps were at times lucky to not be reduced to fourteen men (hold that thought). Regardless it’s a superb position squandered. That missed chance to close is a trend that underlines Wasps performance in the closing stages of the game. Quins ability to speed the game up is theirs. It's difficult to overemphasise the impact Danny care has on this game. Even before the introduction of Marcus Smith the difference in control exerted by Care to Simpson is quite startling. Quin's by way of Care completely dictate the tempo and structure of the game while in contrast Wasps continually squander multiple opportunities to put it away whilst a freshly subbed on Simpson struggles to adapt to the tempo of the game. It's scrappy but Quins take the ball wide extremely quickly and challenge the Wasps defensive edge. 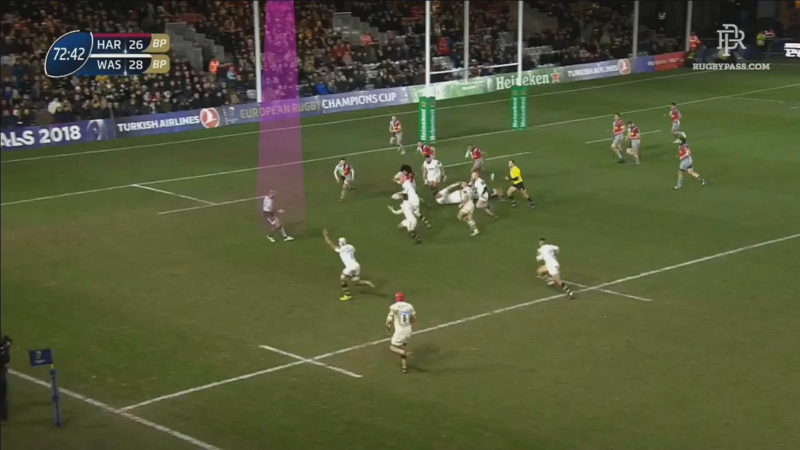 Additionally, watch the bottom of the clip and track Simpson's movement post lineout. Obviously two very different roles but for Simpson to not be tracking the ball and organising defence I would think is unusual. Care then works a snapback pattern for a couple of phases to counter Wasps aggressive line speed. Once Wasps are moving backwards Care then work's his team back across the pitch and while Wasps line speed isn’t bad perse we can see Quins are finding the weak shoulders. Getting the contact as individuals and still recycling the ball. That in itself is a good indicator of the level of fatigue in Wasps defence, they are no longer able to dominate the contact and, desperately in need of someone to organise their defence, concede a penalty left of the posts for offside. To go through every phase of play would take forever but throughout the next 20 minutes, there is a definite trend in how easy Quins find it to win the contact area. Its also clear Wasps are struggling to cope with the game's flow and that momentum is starting to slip away from them. Quins, on the other hand, sensing this is a crucial moment in the game, and with 20 minutes to run Quins win a penalty and during the break in play introduce Marcus Smith and Quins. Quins Up the Tempo again! It would have been easy for Quins to go to the corner set the line out and go for the catch and Drive. With the prolonged break in play for substitution and injury Quins don’t want to give Wasps any more recovery time and instead Care looks to increase the tempo again with the tap and go. Wasps, likely expecting to defend a lineout drive, are frantically defending their try line and even though Quins are held up we can see the levels of frustration in the Wasps players and in contrast the energy boost in Quins. From the scrum, Quins build 9 phases, including a half break for Smith and Care darts over closing to within 10 points. I think we're starting to see how much of an influence the Quins halfbacks are having on the game, with care picking the runners and Smith probing the fringe defence and running the wide attack. For Wasps, it's a case of chasing the shadows of an attack pattern that poses many questions. It's tiring and frustrating to defend and we see errors creep in (such as Watsons kick on the full and Macken's poor clearance kick off a turn over). Perhaps it’s the perception that their 10 point lead will be difficult to chase down perhaps it’s just fatigue but Wasps defenders continue to fall off the pace and tackles. Quins score again to see the final 10 minutes played at 26-28. No question it's a fantastic pass from Smith and a good finish from Elia, but If Le Roux gets a hit on, or Simpson goes low there is a chance to save this. Wasps will have to be questioning the desire of Le Roux, Simpson and Wade to so easily let Elia drive over. Despite It now being a 2 point match Wasps still have a perfect chance to wrestle the momentum away from Quins, by putting them under pressure from the kick-off they can aim to run down time by playing the game in Quins territory. Things don’t quite go for to plan for Wasps and as Cipriani kicks off we can see Wasps have perhaps got it wrong. The ball is set to drop outside the Quins 22. The idea is for Wasps to challenge for the ball – but it’s the end of the game, they are clearly struggling from fatigue and for me, a better option would have been to kick a fraction longer into the opposition 22 and put them under pressure. The two outcomes from kicking long would likely have been Quins kicking to touch. That extra couple of metres on the kick might have sent the 5 quins forwards backwards to the ruck and allowed Wasps a softer target to come onto and perhaps counter ruck and cause messy ball pressuring Quins exit from the 22. As it is we can see Wasps don’t even challenge for the ball with a single chaser making the initial hit Quins are able to control the contact and get around the ball despite being driven back into their 22. On paper, it looks like Wasps have done the right thing but they are slow to set up and Quins go on the short side and Wasps again give up soft yards allowing Quins to work their way upfield about 15m or so. So Quins have front-foot ball and a good kick chase formation with Visser on the touchline and Sinkler running a close line. Care hoists into the box for both players to chase pressuring Le Roux. Wasps clear up before Cipriani plays the ball deep into the corner. 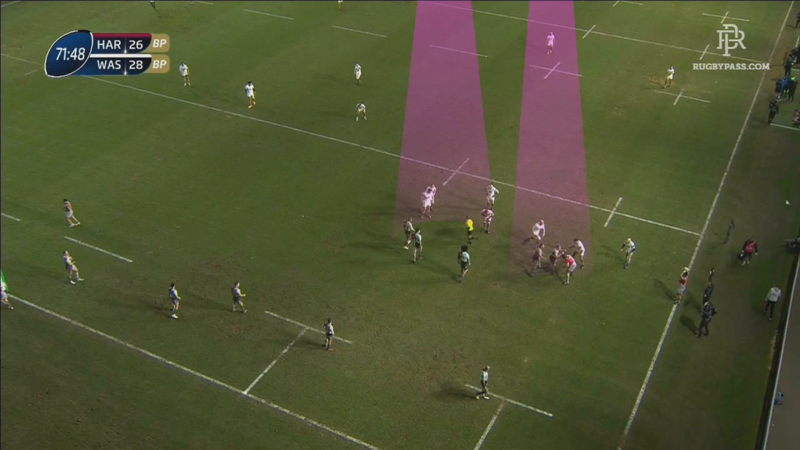 It is, in fact, a good option from Cipriani, and we can see the intent is to keep Quins in their own Red Zone. For the first time, we see Wasps intention to wrestle back control of the game. Quins are really only using a twin pod line-out. With reduced jumping options this is a perfect opportunity for Wasps to attack Quins ball. Instead, they stay on the floor, and Quins getfree ball and set a maul marching Wasps back to the edge of the 22 before Care kicks to the halfway line. Tactically I find this an odd decision by Wasps who are clearly struggling with the tempo of this final 20. A question I would ask is why they expend valuable energy fighting a maul in the opposition 22 when they could have attacked the Quins ball, tried to make it messy and hopefully make Quins play into the midfield or kick from deep in their own 22. Regardless Wasps counter attack through Carr and building phases we see some wonderful offloading before they then manufacture a stone cold scoring opportunity. We can see Brown is completely isolated against 5 Wasps attackers, his only assistance is Care who is on his inside and not getting to the outside channel. Back off and hope Wasps delay the pass enough for Care to get there. Pressure the ball carrier into making a mistake. He goes for option two, stepping in to pressure Myall into taking contact and Wasps squander a sure-fire scoring opportunity and a chance to kill this game is gone when Simpson duly passes the ball into touch at the ruck. Which brings us to the next poor decision by Wasps when they decide to kick for goal off the resulting penalty. However, 5 points is not two scores out – Quins need only score to draw level and a converted try takes the game plus Wasps are tired and their defence has struggled for the last 10 minutes to get any defensive rhythm. So I would question is this a chance for them to sap Quins newfound energy, put the halfbacks into defensive mode. Waste a good minute or so setting up the lineout. A catch and drive while tiring would eat up time and is harder to get the ball back for quins. A try likely seals the game. Even if they lose the lineout Quins probably will kick to midway and Wasps again attack in the Quins half. As it is Cipriani misses the kick and Quins kick the ball back to Wasps. Mentally that's a huge let off for Quins, Wasps put the foot on the throat and fail to press down. Quins again look to target that left-hand side and Wasps struggle to secure the kick. And we enter probably the defining sequence play of the game for Wasps. As they move the ball wide this is another chance to push Quins back onto their own try line but instead Wasps attack and move the ball right across the quins defensive face. If we watch the ball movement it's incredibly lateral this is another good indication of the levels of fatigue Wasps are experiencing. No one wants to make a decision, no one really wants to straighten the line and make contact, ask questions of the defenders, it's just a nothing play and Quins just Jockey off the ball until Armitage is isolated and steal the ball. Care and Smith immediately move the ball wide and the result is an isolated Haskell makes a decision to blitz Roberts and Quins outflank the Wasps defence go coast to coast nearly scoring a try and then come all the way back for Haskell to be given a red card. The challenge by Haskell is poor and for me, it's a red card, but from a defensive point of view, there was absolutely no need for Wasps to have put him in that position. Note how deep Smith is sat, and how the ball transfer is so deep behind the front line allowing them to transfer the ball to the outer edge of the defence – again this is poor defensive read form Wasps who instead of blitzing up needed to just drop off the pace, slide out to the right and make Quins play back across the field. It's poor from Wasps and almost certainly a result of tired legs but I think that's their final chance to completely close the game out. Quins play to the lineout, catch and drive and for once make a mistake in Smith chipping in behind, it gives Wasps the ball. Perhaps this would have been a good opportunity to Run the clock down with some pick and goes, or to hammer the ball down to the far end and make Quins play out of their own half again – Simpson said post-match that is Wasps strategy in these situations but exhausted and lacking in control they don't really do anything with it gifting the ball back to Quins who go again work the ball wide attacking Cipriani and Wade down that left-hand side. As the final phases play out we can see how disconnected Wasps defence is as Quins attack the outer edge and how they are beginning to work in isolation. Here Cipriani makes one last desperate call and fires up but of the line. A good decision by Cipriani but without any press on the inside he's just isolated and exposed and Quins get over the gain-line anyway. And after 12 phases Quins crash over for the try. In the context of international selection, this sequence of play I think shows us why players such as Cipriani, Wade and Simpson just aren't in the mix despite Wasps their form for Wasps. For Cipriani whilst we all know his attacking skills the lack of leadership and the passive defence play right into Quins' hands. Likewise, Wade being constantly exposed by power runners on that right edge is absolutely why he is nowhere near the national squad. Conversely, the control and speed which care and Smith play at I think shows exactly why they are in the extended squad. I think there is a good chance we'll see Care start a couple of games for England in the 6 nations, and I think we're likely to see Smith on the bench when we come to the summer tour to South Africa – perhaps with Ford or Farrell taking a well-earned rest, we'll have to wait and see. Wasps have struggled over the last few months with a huge amount of injuries but against Ulster, La Rochelle and now Quins they've shown a weak underbelly and a severe lack of game management outside of their first choice halfbacks that teams will continue to look to expose. That weakness and inability to close out the game is perhaps rooted in a number of issues, injuries being one of them, as is, it seems fitness, but wherever it stems from if Wasps don't address it quickly they could find themselves struggling come Premiership end. Quins, on the other hand, are an interesting side. Embracing speed, skills and fitness as their weapon of choice they have a slew of exciting and extremely talented players coming through, Smith is the obvious choice but Lang showed plenty at 10 and an ability to glide into the gaps from 15, the addition of exciting players like Earle to the mix is likely to compliment that and with a relatively young pack and a general supreme in Care running the show there seem to be the genuine foundations to build a future upon and inconsistency is probably going to be their biggest enemy this year their ability to turn over the very most top teams on any given day makes them an exciting watch for the neutral observer they may not be the full package just yet but they are certainly heading in the right direction.